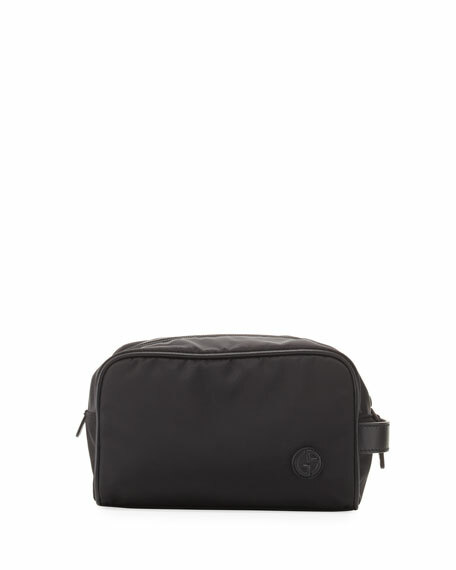 Giorgio Armani toiletry travel case in nylon. Embossed leather logo patch and side handle. 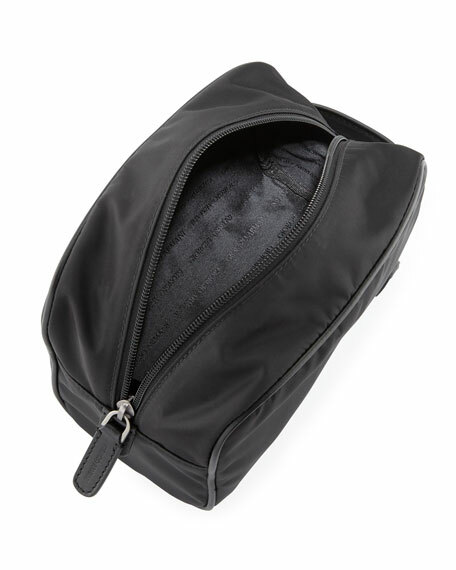 Zip-top closure with logo-embossed pull. 5.3"H x 8"W x 4.3"D.
The Giorgio Armani collection came into being in 1975, when the designer rewrote the rules for menswear, revolutionizing proportions and aiming at an unheard of fluidity and elegance. The following year, observing that the fashion needs of women were also changing, he offered the same soft, unstructured jackets as the basis for a new womenswear collection. Since then, the line has never ceased to evolve, with continual research into an aesthetic based on essential, never ostentatious, style as its outstanding trait. Elegant, modern and sophisticated, the Giorgio Armani collection stands out for the excellence of its manufacture, the extreme attention to detail, the purity of the lines and the use of high quality materials. The clothes are designed to bring out the wearer's personality, never to overwhelm or disguise. Roberta Armani answers our 5 Questions. For in-store inquiries, use sku #2053718.